A new art project by Richard Clar will bounce images and sounds representing the moon landing off of the moon, capturing the radio waves with this satellite at the Dwingeloo Radio Observatory in the Netherlands. Just in time for this Sunday's (Sept. 27) lunar eclipse, artist Richard Clar will execute two moon-inspired projects that will send a part of Neil Armstrong back to the moon and create an introduction between the "light side" and "dark side" of the lunar surface. 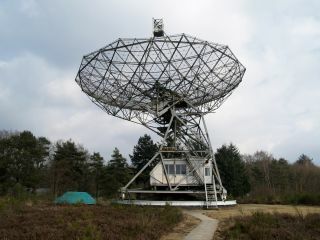 Clar's two-part event will bounce some very special radio waves off of the moon from a radio dish in Italy and retrieve them at Dwingeloo Radio Observatory in the Netherlands. The first transmission is encoded with a version of Armstrong's heart activity that was recorded as he became the first person to set foot on the moon, as well as an image of Armstrong's moon footprint. A second signal will carry an image of the moon's dark side, which only the Apollo astronauts have seen in person. The transmissions, called "Giant Step" and "Lune sur la Lune" ("Moon on the Moon"), will be made on Sept. 27 at 9 a.m. EDT (1300 GMT) and 11 a.m. EDT (1500 GMT), respectively, and will soon after appear online at www.rockthemoon.com. For the project, Clar took a copy of Armstrong's electrocardiogram (EKG) — a record of his heart's electrical activity — captured as the astronaut stepped onto the surface of the moon for the first time. Clar turned the EKG into sound with the help of data scientist Ryan Compton. Then, jazz performer Roberto Miranda used the EKG as inspiration for a series of sounds on the double-bass. That recording will fly on Saturday along with the iconic images, also in the form of radio waves. The "dark side" image will bounce off the moon's "light side," which is always facing Earth. First footprint on the moon left by Neil Armstrong. "I wanted the art to say something about the first humans to set foot on the moon. Think how many living beings have observed the moon for eons … and now we have made a number of trips to the moon and back. I want people to have new experiences through my artwork," Clar said in a statement. This project is inspired by artist Daniela de Paulis' work bouncing images off of the moon, which she first did in 2009. (One of her projects worked with NASA to beam moon-inspired children's artwork off of the lunar surface.) This is far from Clar's first stab at space art: His projects have used new technology to explore orbital debris, the search for extraterrestrial life and other out-of-this-world themes.